» Solar PV will increase demand for Australia’s mineral resources and energy consumption! Solar PV will increase demand for Australia’s mineral resources and energy consumption! Solar PV boosts Australian resources demand and maybe the CO2!! I want to share you with an excellent video published by Martin Green (NSWU) approaching of the future forecast of Australian Mining market variations linked to world Solar PV market evolution. The video points to a $6.7 bn annually increase of income in Australian mineral resources sector by mid 2020 due to the world production of 1 TWp world installation. 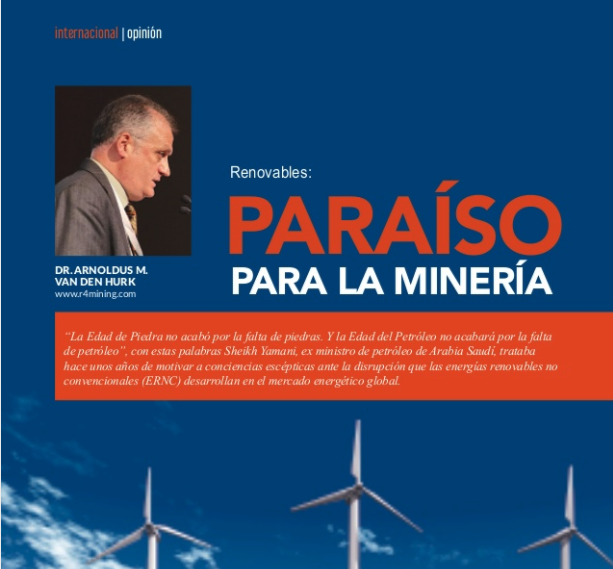 “Renovables, Paraíso de la Minería” (August 2016; “Renewables, Paradise for Mining”. Energía y Negocios 2016). I included not only solar but wind generation, transport and energy storage with requirements of 240 million tonnes of Copper to transform all the current coal fired power plants in the World into solar PV plant because the needs for copper in power capacity are 4 to 6 times and the needs in electricity production reach to 16 – 20 more than coal-fired thermal electricity production. Martin Green Analysis, is Solar PV great business for mining commodities? Copper, 5 million Tones (5 Tn/MWp) which means $2.1 bn/yr of increased earnings for Australian mining. 6.7 billion USD of Profits in Australian Mining Sector, not bad news for miners!! In analyzing CO2 emissions production, we need to study the “hidden emissions” linked to the production of these minerals and metals to produce pv panels, windmills and so forth. And other mineral products as quartz sands for low iron glass used in solar PV, quartz for solar silicon production and Cement. What about the power to produce this “Solar” Iron Ore, Copper and Aluminum? Current Copper production in Chile, Peru, Mexico, US, Africa, Australia combined with smelting in other countries (China, South Korea or Japan) for copper cathodes (99.99) requires an average of 5.2 MWh of electricity per tone of metal. In the case of Chile in mids 2020 the requirements will increase to 6-9 MWh/Tn mainly due to mine aging, desalination and pumping water to the mountains. Current needs for Copper mining (smelting) to produce 1 TWp Solar PV are 5 million tones. 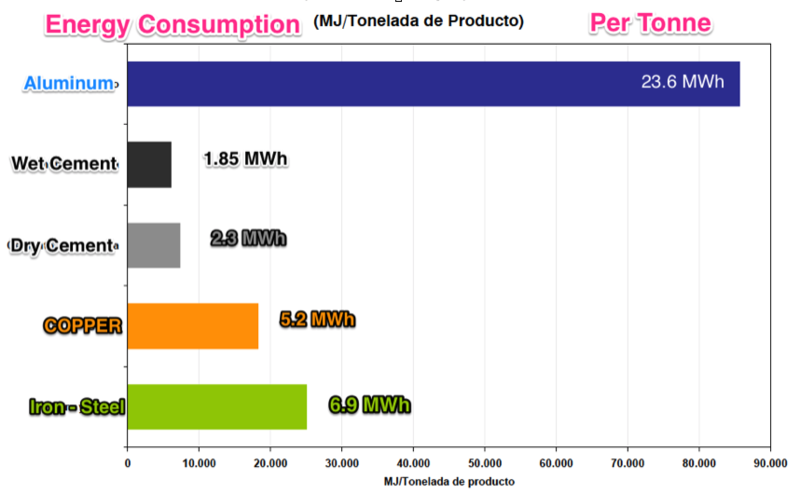 Making the conversion of 5.2 MWh/Cu Tn results in 26 TWh of electricity in mining and / or smelting copper. The Case of Aluminium is even worse: 19 million Tn per TWp solar PV and 23.6 MWh / Al tone deals to 448.4 TWh/yr. 98% of this needs aren’t linked to Bauxite mining production. It is basically smelting. The Economist 2012: "6% of China's electricity demand is linked to the Aluminium smelting sector". In doing so with Iron Ore & Steel we need 6.9 MWh / Steel tone. Today, it is estimated that the global steel industry uses on average 2 billion tonnes of iron ore, 1 billion tonnes of metallurgical coal and 520 million tonnes of recycled steel to produce 1.6 billion tonnes of crude steel, a year. Then those 60 million Tn of Iron Ore to produce 1TWp of Solar PV will implies 48 million Tn of steel. And this steel will need (48 x 6.9) 331.2 million MWh or 331.2 TWh of electricity requirements. The Discussion, what about the use of renewables by mining companies? Mining countries, especially based on metals, will have huge opportunities to develop new production sites thanks to the renewable and energy storage industries, so it would be logic that mines begun to use renewables for their self-consumption as a mainstream habit for the sector. We have a good model in the Clouding sector having similar percentage of OPEX energy cost, we see Google, Apple, Amazon … no only consuming renewable energy but investing huge amounts of capital in the clean markets. And what about miners? Are they producing Coca Cola and drinking Pepsi Cola? Do you imagine the President of Coca-Cola drinking Pepsi-Cola? … this is the way of most mining companies approach to renewables, it’s great for the business … but we don’t use it! !